Kintsukuroi is a concept very close to my heart. 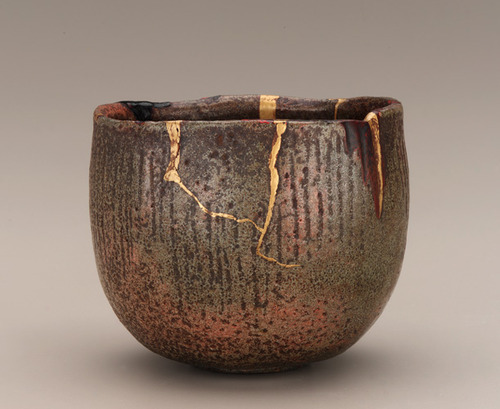 Like these pieces, my body bears the marks of having been broken and put back together again (multiple times). Oh, the stories a few inches of skin can tell! I find these items breathtaking, and would very much like to create one or have one in my home. Upon reading about this technique and philosophy, I was reminded of a thrift store statue I purposely bought in a broken state (despite the urging of a well-meaning shop owner to opt for one in better condition); a angel holding a bird whose wing had broken off. Though no more than half an inch was missing, the entire meaning of the statue changed with that broken wing. The bird was not dallying for a moment in the midst of carefree flight as originally intended, it was being cradled, protected, healed by a benevolent protector. As I continue to move through my (still unspeakably slow and challenging) physical recovery, I rejoice in the lines on my flesh that saved my life and the metaphorical gold within them. 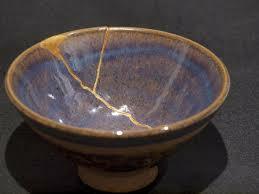 I am not broken…I am Kintsukuroi, right? This entry was posted on July 20, 2014 at 3:16 pm and is filed under craft, home, inspiration, japan, wish list with tags craft, home, inspiration, japan, wish list. You can follow any responses to this entry through the RSS 2.0 feed. You can leave a response, or trackback from your own site. These items look to me as though the breaking of them has allowed the precious metal inside to shine through. What a lovely way to fix broken things to make them even better. And you are definitely kintsukuroi! A lovely post. 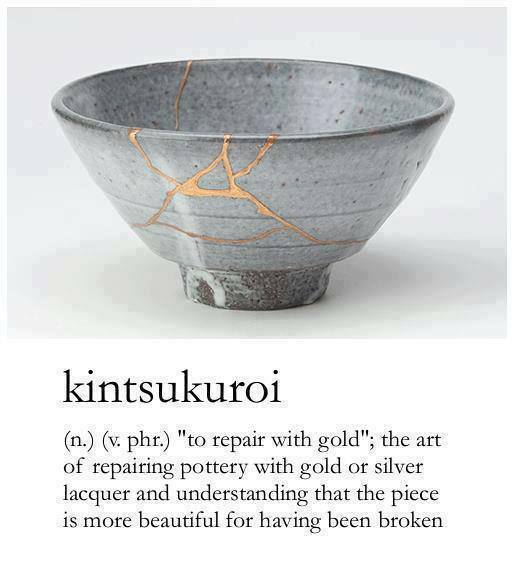 I’ve never heard of Kintsukuroi before, but it is a term worth remembering. Thank you. Those “imperfections” and repairs show a strength and versatility that makes all the difference. Maybe it is why I like old things better than the new. They persevere. They withstand and battle against what they are put through. True beauty is not perfect. What some see as flaws, I also see as badges and statements. They should all be worn with pride and honour. Wow, I really like this pottery, it’s got such character. Incredibly touching post, too, Dana. Well Bettie pretty much nailed it I would say. As you know oh so well, Dana, I know exactly how you feel. Though my scars was emotionally traumatizing and devastating in every aspect of my life, I prefer who the monster turned me into too. I may look shiny and new now, but nothing’s really changed, not at all and I will never change, only for the better. Thank you so much Bettie and Eric! You two are wonderful friends and I feel great comfort and kinship in our ability to view life as we do. Beautiful Dana! This is the first I’ve heard of it. My panda bear sugar bowl could’ve used a bit of this magic. 😉 ah well, thank goodness for super glue! He may be chipped and cracked now(I was having a clumsy morning), but I love him just the same. Great post Dana. It’s a beautiful idea because it opens up a whole other side of life in which we can find joy and meaning. The world can seem so cold and unfair…I feel it’s up to us to celebrate whatever, wherever we can. I hadn’t heard of this, but I’ll definitely check it out now. Thank you! This was very inspiring, thank you.